Back to the James Bay region in September again! I was hoping this time to reach the area during a period of non-rainy weather, for once, but I was only partially successful. My goal for this trip was to drive to the end of the Trans-Taiga Road and back. 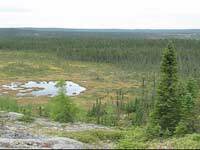 The Trans-Taiga Road is an extremely remote road that starts at km 544 of the James Bay Road and runs east for 666 km, almost to Labrador. At the very end, you are 742 km from the nearest town! For those of you new to this area ... the James Bay Road starts six hours north of North Bay (Ontario) and proceeds north on the Quebec side of James Bay for 620 km. There are only two towns on it, Matagami at the beginning and Radisson at the end. Radisson is MUCH farther north than Moosonee, which most people in Ontario think is pretty far north. It's a huge empty land of wilderness, not spectacular scenic-wise, but spectacular because of its remoteness. This was my 5th trip up here. 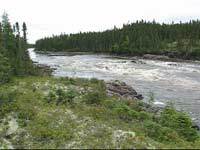 I spent the usual day just getting to the James Bay Road, and I camped that night at Olga Lake, at km 48. Spectacular Sunset! It rained later. The next day was cool, windy and overcast (sigh!). I stopped at km 161 to stretch my legs and go for a short walk up to the top of a ridge for the view. If you have a high speed broadband Internet connection, choose the High resolution size (640x480). Otherwise select the Regular resolution (320x240) size. And further on I stopped at the Broadback River to go for a walk upriver to look at the rapids. Here's a movie of these rapids. 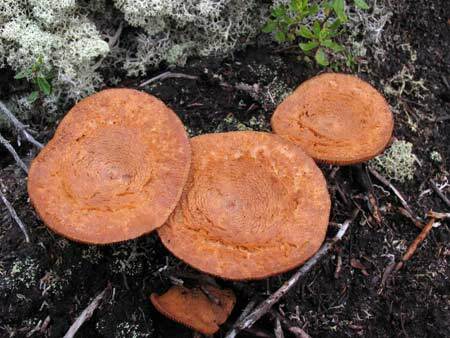 Along the trail I found these leathery-looking mushrooms. 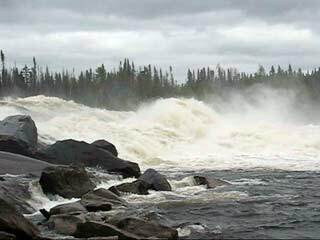 Then on to the spectacular Rupert River and its huge rapids. 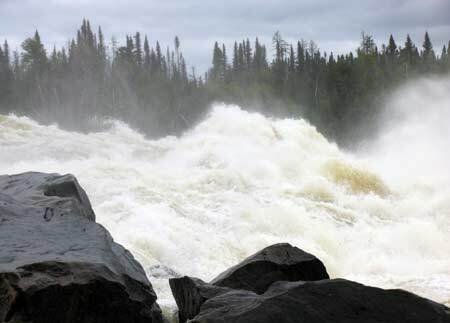 This photo gives you a good idea of why these rapids are called "Oatmeal Rapids" - because that's what they will do to you if you try to run them. At least two people have died trying. 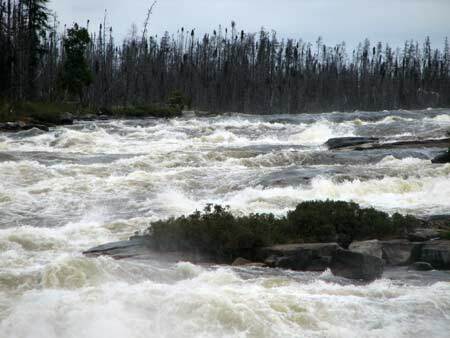 These rapids may be no more after 2007. 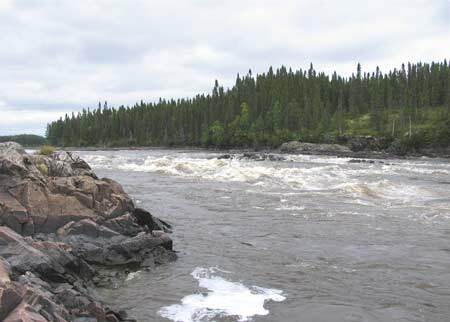 Hydro Quebec has plans to divert this river northward to feed our voracious appetite for electric power. Yet, a little conservation on our part will go a long ways towards preserving places like this, of which there are so few left. Look around you day or night. If you know what to look for, you will see appalling waste when it comes to electricity usage. A couple of years ago the Crees of this area voted in a controversial referendum to approve this project. It was controversial because it was rife with all the backroom dealing that characterizes politics everywhere. However, a new chief has just been elected, partially on a platform of environmental preservation. He advocates building a wind generator farm instead. We'll see how much he is able to do. And just in case you're thinking right about now that those rapids don't look so big... have a look at this movie of them. If you can, download the High-res movie and play it maximized with the sound turned up. This will give you a sense of how big this river is. There's lots more movies and photos of the Rupert River on the Rupert River website.